This excellent books draws on an archaeological investigation of a garden opposite the Taj Mahal, originally forming part of a single composition. It is edited by the leading scholar of Mughal gardens but wears its scholarship lightly, making an most enjoyable read - on high quality paper and with superb illustrations. It is always a pleasure to come upon fresh information on garden history. Too many books mreely re-cycle older material. This book provides fresh and reliable information on a little understood topic. Because the Mughal rulers were seen, rightly, as an occupying force, the art and architecture they left behind has not received the attention it deserves. The fact that Persian was the court language is a second barrier to most Hindu scholars. The Moonlight Garden remained unknown for an another reason: it was buried in mud by river floods. 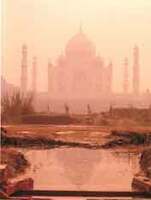 The authors explain that it was a place to escape from the formality of the Taj Mahal and enjoy fruits, flowers and views. The name Moonlight Garden (Mahtab Bagh) comes from the time of day at which it was used, after the scorching day turned into a brilliant night.